The silence over Calais stands in opposition to the flurry of heritage scholars advocating the preservation of Adolf Hitler’s birthplace and earliest home in Braunau am Inn, Austria. Both Calais and Braunau share a repugnancy that revolves around their unpleasant stories and unresolved effects. Hitler holds a persistent grip on our collective imagination and exerts an especially unsettling effect on right wing extremists; Calais lays bare the crisis of humanitarian idealism that risks being undone by state passivity and xenophobia. In both cases some planners hope that razing these reviled spaces will eliminate the public discussions they spark, but there seems to be a more productive discussion harbored in their preservation than in their absence. The Hitler birthplace in 2008 (image Mattes). Hitler was born in the rental flat in Braunau in April 1889 to Alois and Klara Hitler. The Hitlers were residents of the Salzburger Vorstadt 15 flat for a short time and lived in Braunau for just three years, but it became a place of homage to Hitler when the Nazis rose to power. 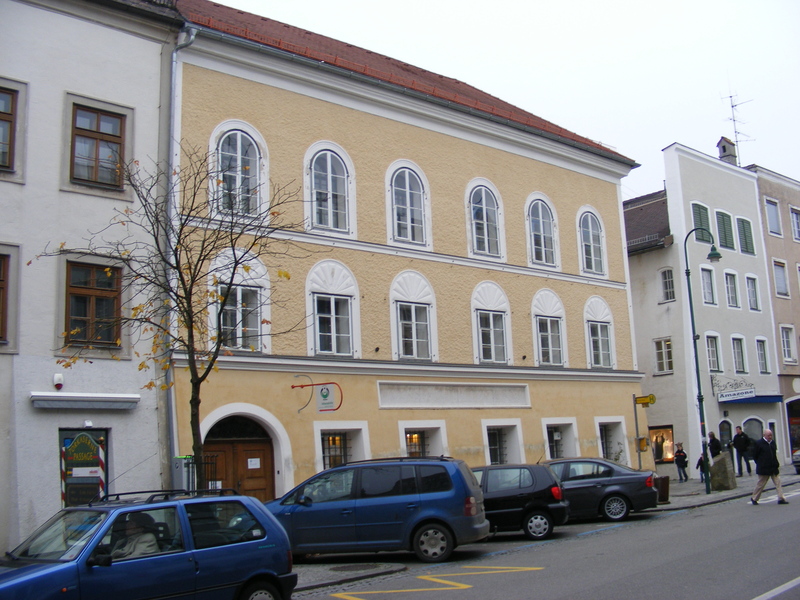 Recognized as Hitler’s birthplace in the early 1930s, Martin Bormann purchased the building for the Nazi party, and the building received preservation protection when Austria was annexed by Germany in 1938. The building was visited by German soldiers during the war, and like many postwar sites Nazi sympathizers visited it in the wake of the war. In 1989 a Memorial Stone Against War and Fascism was installed on the street at the building, and while the building is otherwise unmarked its history is well-known. The structure was returned to its original owners in 1952 and remains in the family’s hands today, but it has been rented by the Austrian government since 1972 and stood vacant since 2011. In April, 2016 the Austrian government resolved to secure the building to stop neo-Nazi pilgrimages to the building. Austrian officials have debated razing the building completely or radically re-modeling it, in either case “cleansing the structure of any association with the Nazi leader.” Austrian Interior Minister Wolfgang Sobotka led the charge to raze the building completely, but he has apparently agreed that a radical makeover rendering it “unrecognizable” would be acceptable. 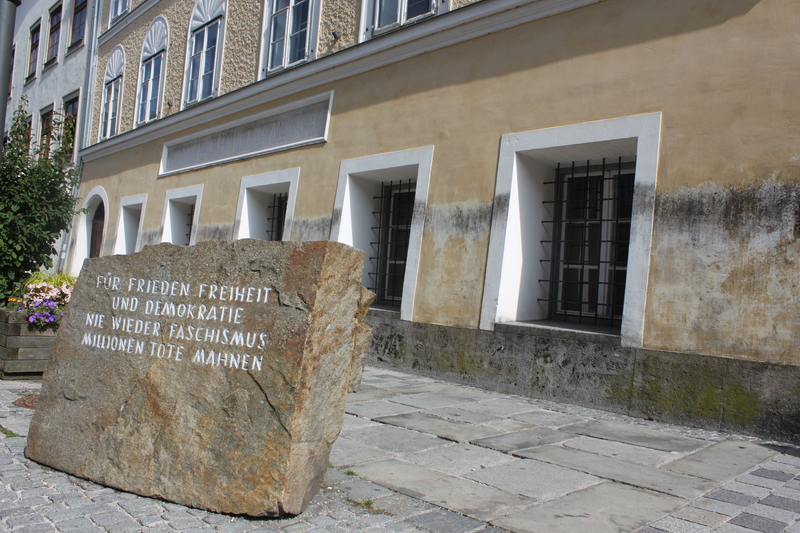 The 1989 Memorial Stone Against War and Fascism at Hitler’s birthplace (image Anton Kurt). For many observers the demolition of the building is simply a clumsy if not misguided effort to escape an unpleasant history that will not be erased by the wrecking ball. Mely Kiyak argued in Zeit Online that tearing down the house constituted “a political declaration of surrender” to unwelcome tourists and neo-Nazi pilgrims. She concluded that it is impossible to simply erase the Nazi landscape, conceding that any neo-Nazi who “wants to follow Hitler’s footsteps can do so throughout Europe.” Kiyak suggested that the Braunau site would always be a “Nazi place” regardless of radical transformations or wrecking balls, and she argued that combatting neo-Nazi visitors required an assault on their racist and xenophobic fabrication of Hitler and Nazi history. Like many sites associated with the Nazis, Hitler’s birthplace is a reviled place for some Austrians traumatized by the specter of fascist tourists. Nevertheless, Kiyak is almost certainly correct that even the most thorough material cleansing of the site will not transform how neo-Nazis view Hitler’s history or Nazi materiality. 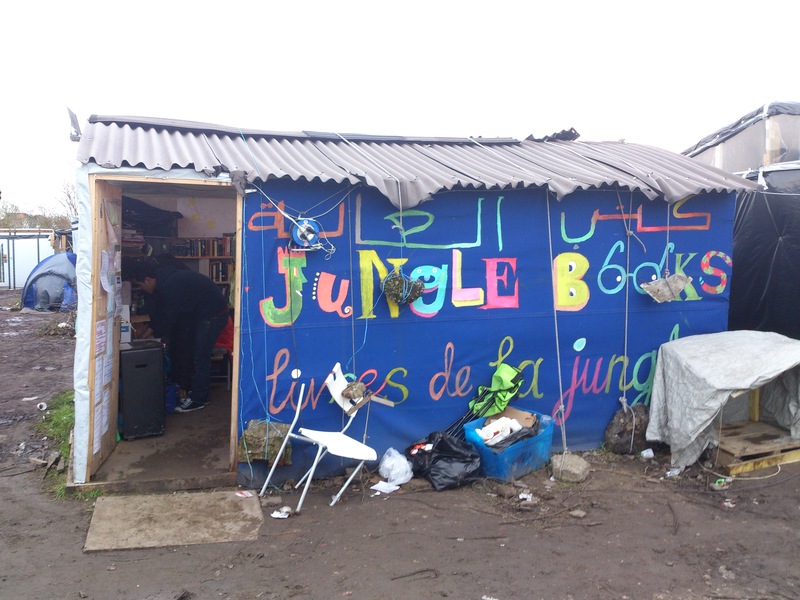 Calais Camp Evictions in March 2016 (image AmirahBreen). Now heritage professionals aspire to preserve Hitler’s home as a self-reflective place if not a provocative material wound, and perhaps that is a productive role for many dark heritage places. Calais is a comparably raw albeit utterly fresh wound, but its failure to secure the same attention as Hitler’s Austrian birthplace suggests Calais is much more difficult to accommodate to authorized heritage discourses. 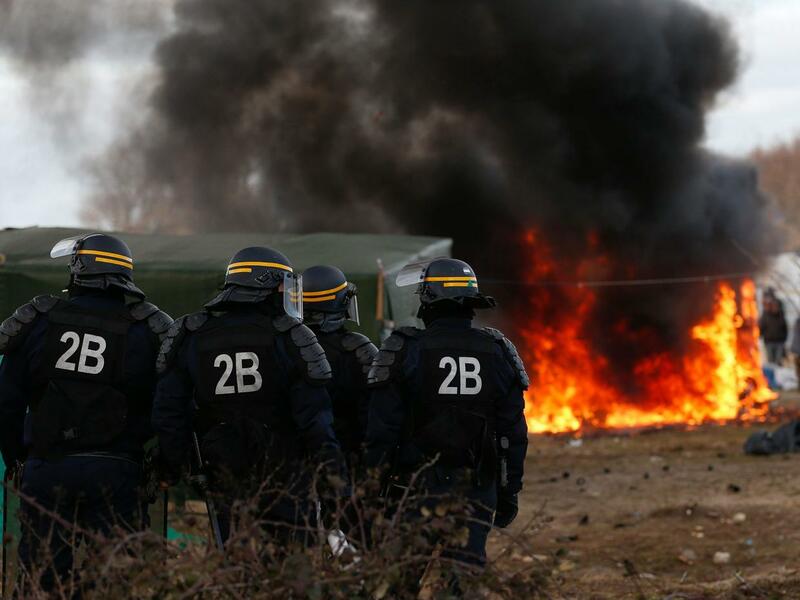 This perhaps reflects Calais’ ephemerality and the basic challenge of how to interpret Calais as a material place. It also suggests that much of the story heritage planners wish to tell on World War II sites like Hitler’s birthplace is firmly situated in the past and distanced from their contemporary effects, which include curious war tourists and neo-Nazi pilgrims alike. 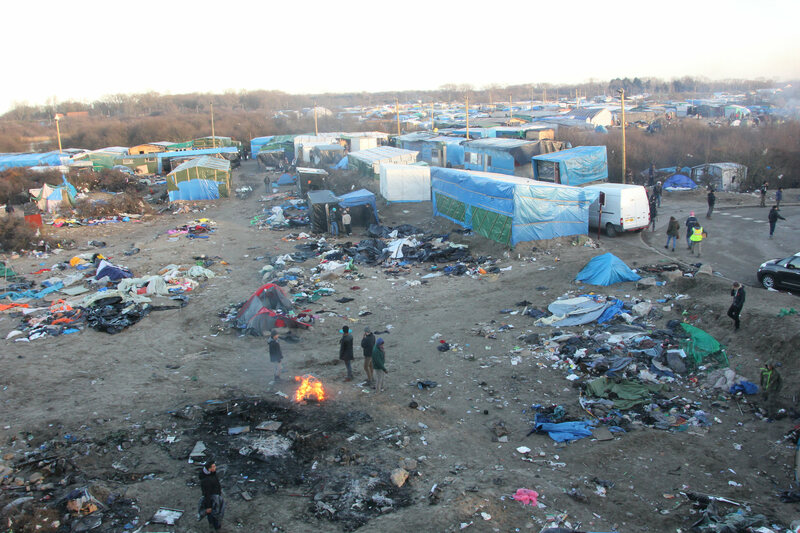 Calais may heighten viewers’ anxiety because of its utterly mundane and present-day material forms: that is, the camps at Calais were a mix of shipping containers, bicycles, clothing, tarps, portable toilets, and of course anguished people that are familiar to most observers. Dark heritage thrives on its capacity to create uneasiness, and both Braunau and Calais induce some discomfort with a heritage that reaches into the present. However, the apparent reluctance to frame Calais as a potentially rich interpretive space like Hitler’s birthplace may indicate the camps are simply too familiar and reviled to be comfortably embraced. Posted on October 28, 2016, in Uncategorized and tagged Calais, dark history, Migration. Bookmark the permalink. 5 Comments. Thanks Dante, I am still shaping my thoughts too, so we are pretty much in the same place. Provocative article, thank you. It is a reminder that we make history by what we choose to memorialize and what we choose to erase. Also a prompt to utilize the digital turn to do as you have here, create memory for all of our lived reality, both the dark and the brilliant. We have had similar debates here in the Six Counties/Northern Ireland about preserving things like the H-Blocks or the ugly fortified police barracks. An interesting post!